For photos, reviews, other places to visit, and tourist information, go to the West Yellowstone online road trip planner . London, UK to West Yellowstone is an approximately 12.5-hour flight. You can also do a combination of flight and shuttle. Traveling from London to West Yellowstone, you'll gain 7 hours due to the time zone difference. Plan for a bit cooler nights when traveling from London in August since evenings lows in West Yellowstone dip to 3°C. Finish up your sightseeing early on the 23rd (Fri) so you can go by car to Missoula. Missoula is a city in the U.S. On the 24th (Sat), examine the collection at Aerial Fire Depot and Smokejumper Center, then pause for some serene contemplation at St. Francis Xavier Church, and then find something for the whole family at A Carousel for Missoula. For photos, more things to do, traveler tips, and more tourist information, use the Missoula trip planner. Drive from West Yellowstone to Missoula in 4.5 hours. Alternatively, you can fly; or do a combination of bus and car. Traveling from West Yellowstone in August, things will get a bit warmer in Missoula: highs are around 35°C and lows about 12°C. Finish your sightseeing early on the 24th (Sat) so you can drive to Glacier National Park. Kick off your visit on the 25th (Sun): explore the striking landscape at Grinnell Glacier, then cruise along Going-to-the-Sun Road, and then take in the dramatic scenery at Virginia Falls. 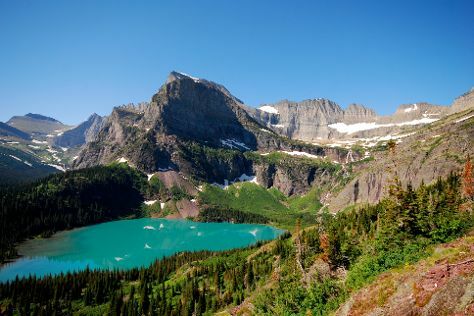 Make your Glacier National Park itinerary with Inspirock to find out what to see and where to go. Getting from Missoula to Glacier National Park by car takes about 4 hours. Other options: do a combination of bus and train. In August in Glacier National Park, expect temperatures between 33°C during the day and 10°C at night. Wrap up your sightseeing on the 25th (Sun) early enough to travel back home.